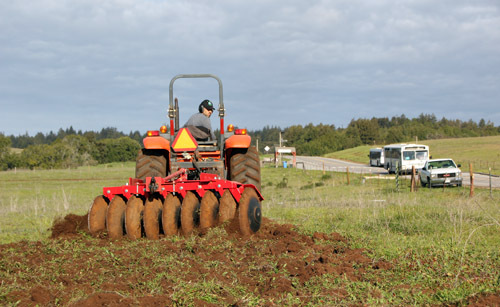 Freshly tilled soil on the west side of Hagar Drive marks the start of the UC Santa Cruz Farm’s latest effort in growing food for campus and expanding the research and education work of the Center for Agroecology & Sustainable Food Systems (CASFS). Dubbed the “Quarry Field” thanks to its proximity to the Lower Quarry, the site adds approximately three more acres of growing space to the Farm. This winter, Darryl Wong, CASFS farm site and research lands manager, tilled the field and planted seven varieties of wheat ahead of last weekend's rainstorm. “With the increased interest in locally produced grains, we want to see how different varieties perform here,” Wong said. The plantings include three varieties from other California growers, and four types that produced well last year in the Farm’s Hay Barn field. “Our hope is to produce wheat for local bakeries, such as Companion Bakeshop, along with UC Santa Cruz Dining Services,” he said. Along with growing food, the field will offer students working with CASFS and Environmental Studies classes a place for hands-on farming experiences, and adds additional research acreage for those interested in studying organic production practices. A generous grant from the Stocker Family Fund of the Community Foundation of Santa Cruz County is supporting the Quarry Field’s development for farming. Wong anticipates that a fence to protect the field from grazing deer will be installed by summer, and interpretive signage is also planned. For now, crops will be grown with available rainfall, although an irrigation line is planned. The 3-acre Quarry Field site was carefully selected to avoid impacting native plants, including Purple Needlegrass (Nassella pulchra), which grows abundantly in the area of the meadow closer to Coolidge Drive. With the addition of the Quarry Field, the UC Santa Cruz Farm now encompasses 33 acres of farm fields, gardens, and orchards, along with lab space, a small classroom, and offices. Founded in 1971, the Farm hosts a diversity of education programs, classes and internships for UCSC students, and, along with the Alan Chadwick Garden, is one of the training grounds for participants in the annual Apprenticeship in Ecological Horticulture, now in its 48th year. The Farm was recently ranked 7th in a review of the nation’s college farms by Best College Reviews. The Hay Barn Field and Quarry Field were originally annexed to the UC Santa Cruz Farm about 10 years ago to compensate for land used by the Ranch View Terrace housing development. Located up the hill from Coolidge Drive, the Hay Barn Field was brought into production in 2014 and now grows a variety of crops for campus Dining Services as well as serving as a research and education site for CASFS. The adjacent Cowell Ranch Hay Barn is currently being rebuilt to house CASFS offices, classrooms, and other South Campus activities.